Over the Thanksgiving weekend, the second film in the Hunger Games series, Catching Fire, set box office records, shattering the record previously held by the first Harry Potter movie. 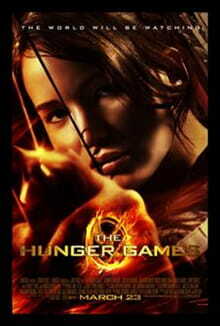 Like the Harry Potter films, Catching Fire and its predecessor, The Hunger Games, is based on a best-selling series of novels aimed at a younger market. But that’s where the similarity ends. There’s no Quidditch, wands, or spells. And while people die in J.K. Rowling’s novels, Suzanne Collins’s books are steeped in death, suffering, and sorrow. Okay, there’s one other similarity: You can’t avoid either the book or the film series. So it’s probably a good idea to engage with our kids on the subject. The name is ironic and telling. Ironic, because while the inhabitants of the Capitol live in decadent splendor, those inhabiting the outlying districts barely scrape by. The name is telling because the defining ritual of Panem is the Hunger Games in which two young people from each district fight each other to the death while the entire nation watches. Hence, panem et circenses, bread and circuses. Collins’ heroine is a sixteen-year-old named Katniss Everdeen from District 12. She’s a reluctant heroine who only volunteers for the Games to spare her younger sister. After her victory at the games, she becomes a symbol of resistance. That resistance is the Catching Fire of the title, a fire that the regime desperately seeks to extinguish, starting with Katniss. As Alissa Wilkinson of The King’s College wrote in Christianity Today, Collins’ novels are a critique of “our entertainment-sodden culture.” The games are the ultimate “reality TV” show: People are literally eliminated by the competition. Not by being brave, bold, or pure of heart but by putting on a good show. Sound familiar? That’s not to say that individual characters aren’t virtuous; Katniss and her co-winner Peeta certainly are. But Panem’s ideology—as in “a set of conscious and unconscious ideas that constitute one's goals, expectations, and actions”—is about power and appearance. There’s another aspect of Collins’ world that stands out: it’s a religion-free zone. The word “god” never appears in the novels, not even as an exclamation. Thus, like many dystopian stories, hope is in short supply. When one evil is vanquished, we cannot be confident that what takes its place will be any better. That’s particularly true for Katniss, who has paid a terrible price to help secure an, at best, ambiguous future. Many fans hated what Katniss had become by the trilogy’s end: broken and somber. But without hope or the basis for hope, it’s a realistic conclusion. It’s this realism, even more than the violence of the story, that you need to talk about with your kids. To help you do that, we’ve got some discussion questions--conversation starters, really--for you and your kids about the Hunger Games. Simply come to BreakPoint.org and click on this commentary to view them.